Our cattle are 100% grass fed and always have access to a field, even in the wettest winter. We have a small herd of Irish Moiled Cattle. The Irish Moile is the rarest breed of Irish cattle and the only surviving breed native to Northern Ireland. They are a hornless breed whose name is derived from the Gaelic language and relates to the distinctive dome or mound on top of the head. The myths and legends of Ireland refer many times to ‘red, white backed cattle’ and skeletal remains with the Moile’s distinctive domed skull have been dated to 640 A.D. 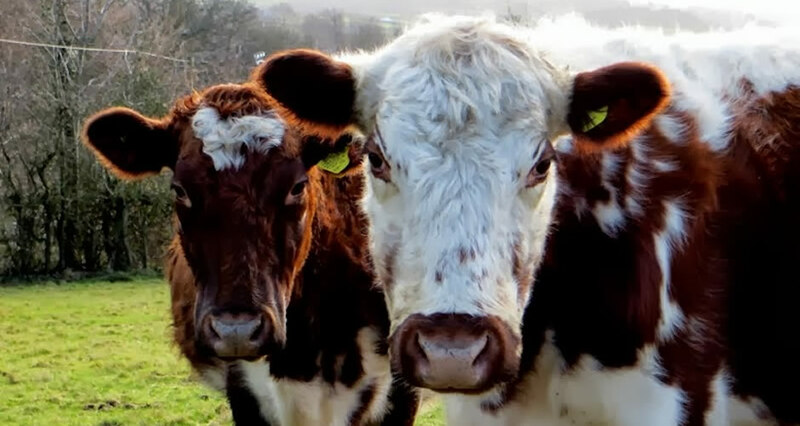 Some Moiled cattle are white with red ears, a pattern of colours associated with the goddess of the River Boyne. What are the benefits of the Moiled cattle? Well, as a man said of Roslea in Fermanagh (in 1832), …”Roslea is the worst and poorest belt of country I ever was in, and I believe that the Irish Moiled cattle are the cows for these hills: nothing else except a hare will live and thrive here.” As opposed to practically all the cows in this country, the Moiled will fatten without the need for grain or commercially produced feed stuffs. They will fatten on a natural diet and their meat is naturally more healthy. Grass-fed meats are rich in all the fats now proven to be health-enhancing, but low in the fats that have been linked with disease. Grass-fed beef also has more vitamins, minerals and antioxidants. Most commercial feedstuffs available in the UK and Ireland contain GM ingredients.